(iii) professional and semi-professional ensembles. Village folk groups operate locally throughout Slovakia. Group membership varies – from the youngest up to the oldest age categories. The simultaneous membership of several generations is not an exception. The activities of village folk groups are oriented especially on preserving and presenting local traditions. Folk ensembles are predominantly established in the urban environment, with members made up of secondary school and university students or younger workers. The repertoire of folk groups is predominantly of a wider, regional scope. Some groups adapt and present dances and music from several regions of Slovakia. A similar situation also applies to children’s folk groups; presently there are approximately 300 of them active in Slovakia. Professional dance ensembles include the Slovak Folk Art Ensemble (SĽUK), the Ifjú Szivek Hungarian Folk Ensemble and Poddukelský umelecký ľudový súbor (PUĽS). LÚČNICA, The Slovak State Artistic Ensemble is a semi-professional dance ensemble. SĽUK and Lúčnica receive contributions from the State Budget in the founder’s competency of the Ministry of Culture of the SR and their seats are in Bratislava. The Ifjú Szivek Hungarian Folk Ensemble is in the founder’s competency of Government Office of the Slovak Republic and the PUĽS in Prešov is in the founder’s competency of Prešov Self-Governing Region. Some folkloric ensembles also have their own folk music groups or singing groups, several of which also operate as individual artistic ensembles. Numerous individual soloists – singers, dancers and instrumentalists operate in the world of folklorism besides them. Dance houses constitute another specific form of folklorism. While various folk collectives and individuals cultivate and promote folklore, especially on stage; the aim of the dance houses is the active teaching of dances and their application as a form of entertainment. The teaching is done by dance pedagogues also known as dance masters. In teaching accompanied by live folk music, the main emphasis is laid on mastering partnership communication and improvisation in compliance with the structure and motif characteristic for the pertinent dance. The dance houses make up for the absence of traditional dance occasions and provide a space for the active enjoyment of traditional dances for the general, expert and lay public. Dance houses have existed in Bratislava and Košice for several years. 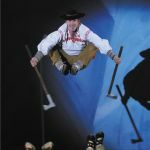 The Dragoons from Bratislava association of dance teachers and the Club of Authentic Folklore Lovers (KMAF) from Košice are their main organisers. Since they have become an increasingly more popular non-stage form of dance folklorism in recent years, they have gradually extended their work to other towns and villages and have begun to appear within the framework of the programme structure of some folk and different-genre festivals.